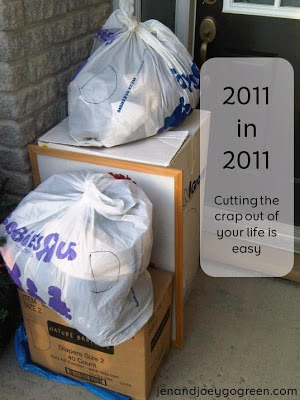 That is the number of things I will be trying to get rid of (recycle, giveaway, sell, trash) this year. I saw the idea on Kid Stuff World today and thought that it is an awesome idea! Plus I really need to organize this place so hopefully getting rid of 2011 things will kick start that process. I am going to start with the office because it is a mess. I keep the door shut it is so bad. It is kind of where stuff goes to die. Phase 2 may just be the garage because it has become a nightmare. If you want to join in here are the guidelines (from Kid Stuff World). If you do end up doing this let me know and I can link to your blog with your updates (if you have a blog). Anything that has taken up residence in your home. Any item using valuable floor/counter/table space you could be using or areas you could be not using in a more calming, soothing way. This could be stacks of papers and magazines, clothing you no longer need or wear, items in your cupboards you haven’t touched in years, toys no one plays with, hair and body products you have never opened … you get the idea. The only items not included in our challenge are things you will be replacing with an item of a similar nature (i.e, – food, recycling, beauty supplies you use on a constant basis, laundry detergent) and items you bring in your home after you start the challenge, like mail, new clothing, etc. The only exceptions to these guidelines are 1) when you leave mail lying on the counter for a week (or more) and it takes control of your kitchen. Go ahead and toss it and count it. Or 2) when you find 5 empty TP rolls in your guest bath or 3) large empty bottles of laundry detergent in your laundry room just junking up the place. Don’t be hard on yourself, just tally them in with your other items and be done with it. Vow to do better the next time around. Week 2 - 225 items Highlight: Why do I have so many Pez dispensers? Week 3 - 179 items Highlight: Remember when perms were all the rage? Week 9 - 79 items Highlight: Why does food come in plastic anyways? Good Luck! Can't wait for the updates. I'm gonna do it too! Great goal! One of my goals this year was to end the year with less than I started. I should keep a spreadsheet so I can compare incoming with outgoing. I've found two principles very helpful in cleaning up problem areas: 1) OHIO (only handle it once) -- forces you to deal with things immediately rather than let them pile up on you, and 2) the five minute rule (anything, including cleaning the closet, can be endured for five minute intervals). Sounds like you're off to a great start!